This video screenshot shows the fireball from a meteor that exploded over Chelyabinsk, Russia, on Feb. 15, 2013, creating a shockwave that shattered windows and injured more than 1,000 people. The Russian fireball and the close flyby of the asteroid 2012 DA14 on Friday (Feb. 15) came at a moment in time when the United Nations is discussing international response to the near-Earth object impact concern. Detailed discussions about the Russian meteor explosion and Earth's encounter with asteroid 2012 DA14 were high on the Feb. 15 agenda of Action Team-14 during the 50th session of the Scientific and Technical Subcommittee of the United Nations Committee on the Peaceful Uses of Outer Space (COPUOS), being held from Feb. 11 to 22 at the United Nations headquarters in Vienna. The multi-year work of Action Team-14 (AT-14) is focused on pushing forward on an international response to the impact threat of asteroids and other near-Earth objects (NEOs). "This event in Russia and the pass of the larger asteroid 2012 DA14 are good reminders that many thousands of objects like it pass near Earth daily," said Ray Williamson, a senior advisor to the Secure World Foundation and a participant in the Vienna gathering. Secure World Foundation is a private operating foundation dedicated to the secure and sustainable use of space for the benefit of Earth and all its peoples. 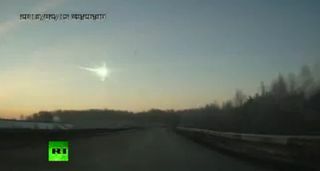 A meteor seen flying over Russia on Feb. 15 at 3:20: 26 UTC impacted Chelyabinsk. Preliminary information is that this object was unrelated to asteroid 2012 DA14, which made a safe pass by Earth on the same day. Williamson said that some objects will be larger and cause considerable damage if they strike Earth. Furthermore, it is critical that efforts continue to identify and track asteroids in order to counter the largest ones before they do serious damage to population centers. "Work is continuing within the United Nations on developing international responses to future threatening asteroids. Given the uncertainties concerning where such asteroids might strike Earth and how much damage they might do, international responses will be critical," Williamson told SPACE.com. Also taking part in the UN NEO working group is space scientist, Detlef Koschny of the European Space Agency’s European Space Research and Technology Center (ESTEC) in Noordwijk, The Netherlands. "The day before we thought it is great timing that 2012 DA14 flies by in the evening … and were shocked when in the morning we learned about the Russia event," Koschny told SPACE.com. "What a coincidence. Was this a cosmic warning shot? It makes you think." For its part, the UN Action Team-14 has been deliberating over the years regarding the makeup and focus of an Information, Analysis and Warning Network (IAWN), designed to gather and analyze NEO data and provide timely warnings to national authorities should a potentially hazardous NEO threaten Earth. That report and its findings are being shouldered by Sergio Camacho who chairs the Action Team on NEOs – a group that was established in 2001. But gluing together a planetary defense strategy is not easy and includes a number of components: from finding potentially hazardous objects, predicting their future locations, and providing warning about future impacts with the Earth. Asteroid 2012 DA14 is seen at closest approach to the Earth on Feb. 15, 2013 (EST). Furthermore, such a strategy also involves missions to deflect impacting asteroids by changing their orbit, as well as disaster preparedness management and, in the event of a NEO strike, shaping a mitigation and recovery plan to counteract consequences. The need for an IAWN had been identified in the September 2008 report: "Asteroid Threats: A Call for a Global Response," a document prepared by an expert panel convened by the Association of Space Explorers (ASE) to assist the work of AT-14. Here is an excerpt of the 2008 asteroid threat report.